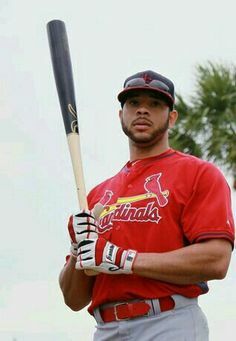 I feel like O'Neill will be our LFer starting next season after Ozuna walks; with Bader in Center. My problem with that is two guys with holes in their swing. Where I'd rather have a 115-120+ wRC+ in the corner OFs and just maximize O'Neill's value in CF and having O'Neill winning out due to the vastly better ISO. Last edited by Big Amoco Sign on February 8 19, 12:50 pm, edited 1 time in total. I see the Bader/Bourjos comparisons in isolation but I think they start to break down when you consider the circumstances of each player. Matheny yo-yo'd and then Kondo'd Bourjos in a way that I think legitimately altered the development of a player who might have had a different trajectory. I'm not saying he was bound to be a star but I do think the woodchipper never allowed that flower to blossom. For Christ sake, it's not Matheny's fault Bourjos isn't any good. Read the whole post next time, sport. I'm not really advocating it...it's just my sneaking suspicion that this is the plan. I have no knowledge of what the front office is planning of course; just my gut feeling. A lot of things can change before then of course. Having three launch angle sink/swim guys like O'Neill, Bader, and DeJong sounds like a recipe for disaster unless the remaining five position players have super high contact/high walk rates. I think launch angle stuff is already getting exploited by pitchers and GMs too. Throwing sinkers out of the zone is killing those guys. Curious if Mo/Girsch are changing the identity of the Cardinals with players like this. This used to be a contact heavy team with pitch-to-contact pitching. It's moved from that somewhat in the last half decade. If Bader holds up that's highly likely. If he doesn't, at least we know O'Neill is an option and available. Twice a week he should sit on a chair, eat pizza, drink beer, and just watch pitches go by. Are you trying to qualify him to be a member of this board?